Mega Sale! Free Shipping Included! 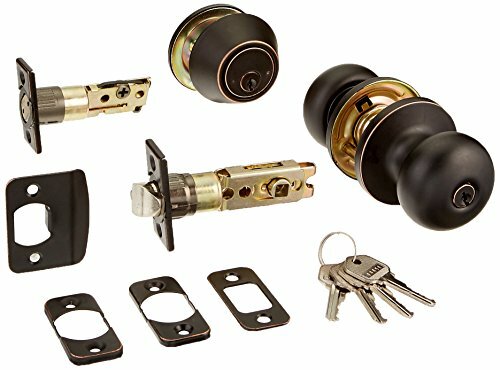 Save 22% on the Design House 727396 Canton 6-Way Universal Entry Door Knob and Deadbolt Combo, Oil Rubbed Bronze by Design House at N Online Agency. MPN: 727396. Hurry! Limited time offer. Offer valid only while supplies last. The Design House 727396 entry knob and deadbolt combo accepts a key on one side of the lock and is operated by a turn-button knob on the other side. The Design House 727396 entry knob and deadbolt combo accepts a key on one side of the lock and is operated by a turn-button knob on the other side. Finished in Oil Rubbed Bronze and designed for left or right hand doors, this knob fits the two most common Backsets in the U.S. (2-3/4-inch and 2-3/8-Inch). this combo pack includes a full 1/2 in. Throw and 1 in. Deadbolt throw. Entry knobs are often used on front doors and back doors. Use this knob on standard 1-3/8-Inch and 1-3/4-inch thick doors with a cross bore 2-1/8 in dia or edge bore 1-1/16 in dia. (1 in. X 2-1/4 in. Radius corner faceplate). this unit features anti-bump pins as an added security measure to keep your door securely shut when locked. This product is ansi Grade-3 certified, which means this knob is rated for residential security. Kw1 keyway with entry lock Ka3 - 3 keyed alike per cut case. The Design House 727396 entry knob and deadbolt combo comes with a limited lifetime mechanical and 5-year finish warranty. With years of hands-on experience, Design House understands every aspect of the home decor industry, and devotes itself to providing quality products across the home decor spectrum. Providing value to their customers, Design House uses industry leading merchandising solutions and innovative programs. Design House is committed to providing high quality products for your home improvement projects.